Nintendo socks, shoes, sandals and caps are now available from skater/emo clothing maker Vans. 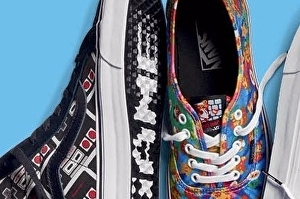 If you ever idly doodled mushrooms and goombas on your Converse and wished for something more official, well here we are: Mario, Donkey Kong, Zelda and Duck Hunt designed duds. This “ultimate two-player partnership”, as Nintendo puts it, also extends to non-foot related clothing such as fleeces, hoodies, shirts and backpacks.